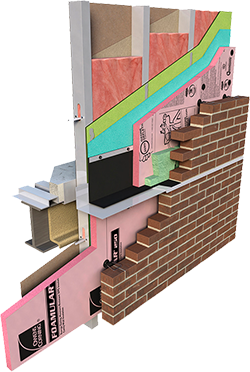 FOAMULAR High-R CW Plus insulation combines outstanding moisture resistance with excellent thermal performance. High-R CW Plus insulation is a rigid closed cell XPS board. The main advantage of High-R CW Plus insulation over other XPS boards is its higher R-value per inch. Properties shown are representative values for 1" thick material, unless otherwise specified. Modified as required to meet ASTM C578, Table 1. R means the resistance to heat flow; the higher the value, the greater the insulation power. This insulation must be installed properly to get the marked R-value. Follow the manufacturer’s instructions carefully. If a manufacturer’s fact sheet is not provided with the material shipment, request this and review it carefully. R-values vary depending on many factors including the mean temperature at which the test is conducted, and the age of the sample at the time of testing. Because rigid foam plastic insulation products are not all aged in accordance with the same standards, it is useful to publish comparison R-value data. The R-value for FOAMULAR® XPS insulation is provided from testing at two mean temperatures, 40ºF and 75ºF, and from two aging (conditioning) techniques, 180 day realtime aged (as mandated by ASTM C578) and a method of accelerated aging sometimes called “Long Term Thermal Resistance” (LTTR) per CAN/ULC S770-03. The R-value at 180 day real-time age and 75ºF mean temperature is commonly used to compare products and is the value printed on the product. Values at yield or 10% deflection, whichever occurs first. Value at yield or 5%, whichever occurs first. Data ranges from 0.00 to value shown due to the level of precision of the test method. Water vapor permeance decreases as thickness increases. These laboratory tests are not intended to describe the hazards presented by this material under actual fire conditions. Data from Underwriters Laboratories Inc.® classified. See Classification Certificate U-197. ASTM E84 is thickness-dependent, therefore a range of values is given.